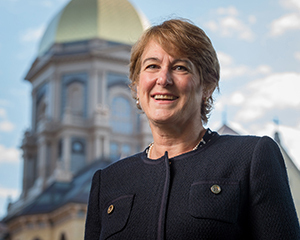 Mary Galvin, the William K. Warren Foundation Dean of the College of Science, sat down for a brief question-and-answer session about her experience, her passion for scientific research and her new role at the University of Notre Dame. The above video includes excerpts from that interview. When asked what drew her to Notre Dame, Mary Galvin is quick to answer: alignment with the University’s mission, and the chance to work with students again. Galvin, who began her tenure as dean Aug. 17, brings with her a wealth of scientific research experience earned in the varied realms of higher education, the government and private industry. After earning her doctoral degree from the Massachusetts Institute of Technology (MIT), she joined Bell Laboratories, where she served for 14 years and became a distinguished member of the technical staff. In 1998, Galvin joined the University of Delaware as a professor of materials science and engineering, and in 2004 was promoted to distinguished professor. Most recently, she served as director of the Division of Materials Research in the National Science Foundation (NSF), where she managed a $300 million budget. “You learn how to balance a budget so you keep all the areas of science alive and healthy, and I think that’s critical,” Galvin says of her time at NSF. “To really tackle society’s problems, we need all the disciplines, we need the tools, and we need the infrastructure. “I resonated with the mission of Notre Dame. We really want to advance their research. And, we care a lot about helping the world: helping those in poverty, improving health, improving the environment, finding energy solutions. I think I can make a difference here,” Galvin says. Galvin assumed the post at a dynamic juncture for the College of Science. Over the past year, the college has developed the Center for Stem Cells and Regenerative Medicine, the Warren Center for Drug Development and Discovery and the DNA Learning Center. In 2016, the college will open work in McCourtney Hall, a new collaborative research space, with the College of Engineering. The progressive nature of the University’s research and science initiatives is indicative of the overall field, Galvin says. Stoking that passion for discovery in young minds may be the aspect of the job Galvin looks forward to most. Originally published by Andy Fuller at news.nd.edu on September 11, 2015.